I made these festive and GREEN for St. Patrick's Day, but you can skip that step and make them for any occasion! Layer a 8x8 pan with cookie dough (may need more than one tub depending on desired thickness of bar). Set aside in freezer. Make the chocolate ganache by heating all the ingredients together on medium heat in a double broiler/water bath. Stir frequently until totally melted and combined. Turn heat off, set aside while you make the frosting. With beaters mix all the frosting ingredients together, reserving some of the frosting to be dyed green. You don’t need much. Take the Cookie Dough from freezer and layer with white frosting and then chocolate ganache. 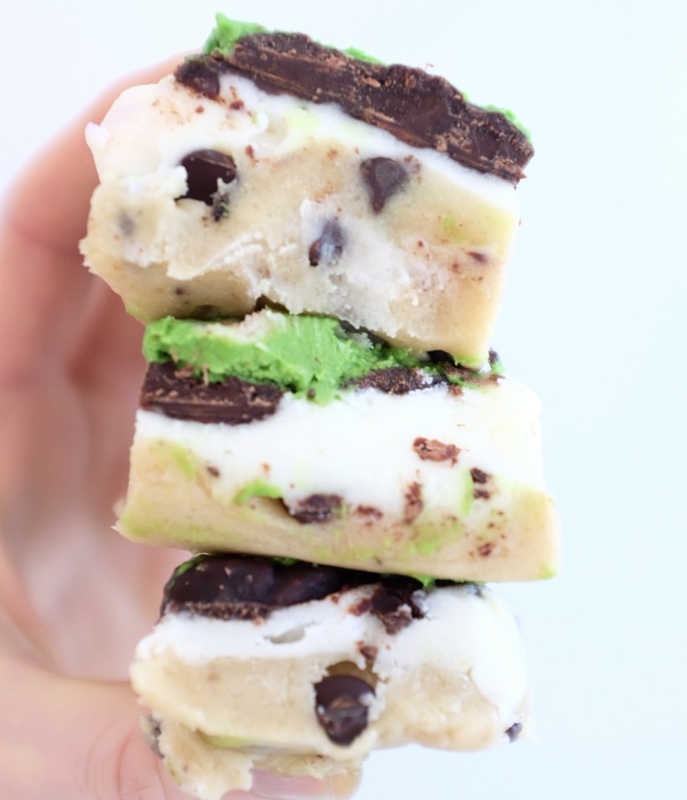 Freeze for 30 minutes and then add the green frosting layer. Then re-freeze for a couple hours before slicing into squares and serving. You can store this in the fridge or in the freezer.